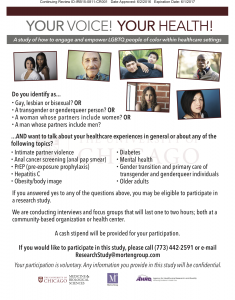 Arshiya Baig, MD, MPH, an assistant professor at UChicago Medicine and an ITM investigator, is conducting a study that will engage and empower LGBTQ people of color in healthcare settings. The study, Your Voice! Your Health! is studying how to improve communication and decision making between these patients and their healthcare providers. Your Voice! Your Health! is recruiting participants. 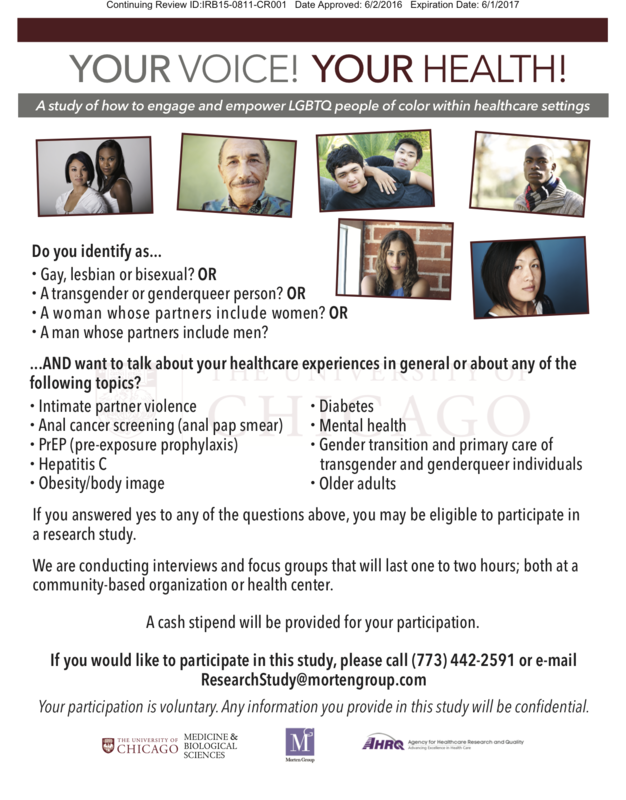 If you identify as gay, lesbian, bisexual, transgender, or genderqueer and are willing to share your healthcare experiences, you could be eligible to participate in this study. If you would like to contribute, check out the Your Voice! Your Health! Facebook page, study recruitment form, or the pictured flyer for details.